We have no idea if this letter of rejection, apparently from Harvard, is real or fake, but we're still weak with laughter after reading it. Ladies and gentlemen, gaze upon a masterpiece that deserves to be framed. 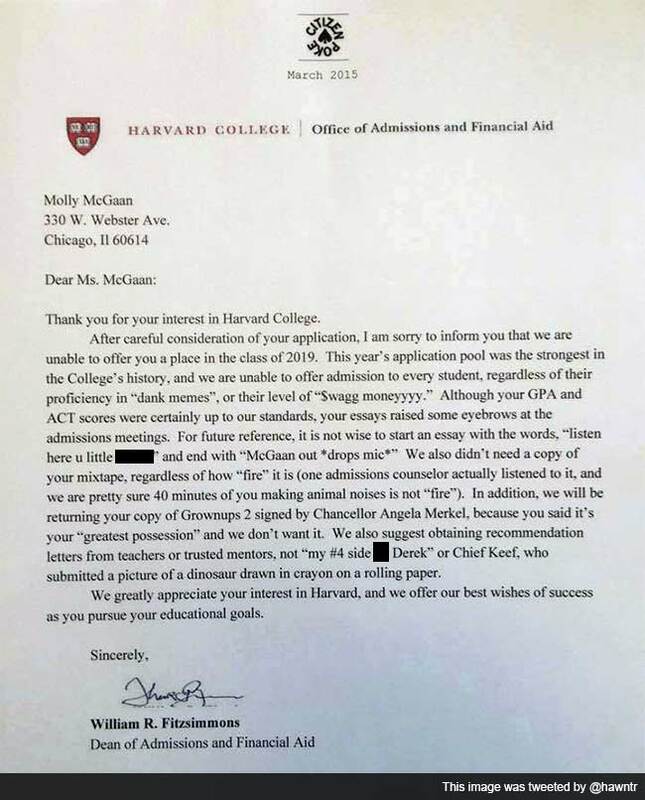 On March 4, Twitter user @hawntr tweeted this photo of a hysterically funny letter of rejection that appears to be from the prestigious Harvard University, no less. After receiving over 50,000 re-tweets in just one day, this is the latest thing threatening to break the now-fragile internet. If the letter is fake, whoever is behind it has done a fine job. The famous Harvard logo looks genuine, as does the signature and name of the actual Dean of of Admissions and Financial Aid, William R. Fitzsimmons. If the letter is real, then rejectee Molly McGaan probably deserved the boot for sending a mixtape and a copy of Grown Ups 2 with her application, which lists her 'proficiency in dank memes' and her 'level of $wagg moneyyy.' The letter also schooled the said millennial on how to write an essay, and in case you were wondering, 'McGann out *drops mic*' is NOT the correct method to end a composition. Hope you're all taking notes. Okay, so it's probably entirely or partly a joke. But oh so funny.